Austin was born 14 weeks early in March 1999. Weighing 1 lb., 13.7 oz. at birth, Austin fought multiple infections during his 11 week stay in the NICU. As a result of retinopathy of prematurity and strong medicines used to fight his multiple infections, Austin left the hospital completely deaf and blind. Other than the deafblindness, Austin is completely healthy, and he does not let his dual sensory impairment slow him down one bit. He is very active and loves to spend as much time as possible outside jumping on the trampoline, hanging upside down on the monkey bars, swinging and swimming. Austin has two younger sisters who love to ride bikes, but this is one thing Austin has never been able to do independently. 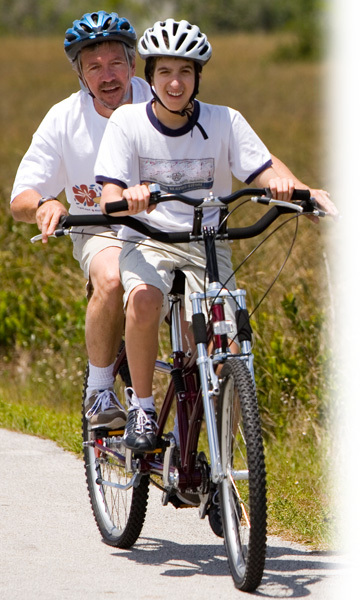 As a result, whenever the girls wanted to go on a bike ride, my husband or I would either have to stay behind with Austin at home or drive to the park or playground and meet them if that is where they were going. 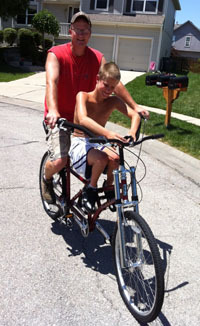 We had little doubt that Austin was capable of riding a bike because of his incredible strength and flexibility. However, we weren't positive, and did not want to spend thousands of dollars on a bike if he ended up not being able to ride it or not wanting to ride it. 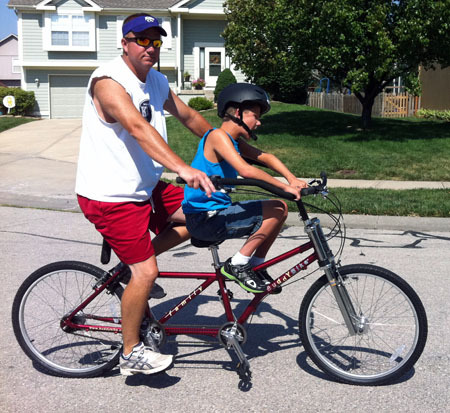 We had been talking to Austin's adaptive PE teacher about different types of adaptive bikes when she heard about Friendship Circle of Michigan's Great Bike Giveaway. She passed the information along to us, and I immediately entered Austin into the contest by uploading a photo and brief biography of Austin. Once voting for the contest began, I posted the information on my facebook page and sent personal email and facebook messages to everyone I knew asking them to vote for Austin and then share with their family and friends asking them to do the same. I printed out the instructions and gave them to my high school students asking those with facebook accounts to consider voting from home. The response was overwhelming. Austin was in the top 5 for most of the voting period, but we were worried because there was only one tandem bike being given away, and we hoped that none of the children with more votes than Austin would choose that bike. Luckily, they did not, and we got the bike. Austin generally needs a little time to get used to new things, so we weren't sure he would be willing to stay on the bike at first and planned to introduce it to him for just a few minutes at a time over a period of days. However, the first time Austin felt the bike he climbed on it and was ready to go. He wasn't wearing a shirt or helmet, so he and my husband just rode around our cul-de-sac for about 20 minutes. He was all laughs and smiles. His sisters were so excited to see their brother on a bike for the first time. 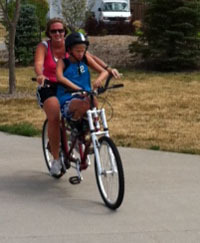 Later that day, we all set out on a bike ride to our neighborhood park for the first time ever. Since that day, we have taken a family bike ride at least once a week, and I don't think I'll ever grow tired of these outings. We are so thankful to Buddy Bike and Friendship Circle of Michigan for making this dream a reality for Austin and our family.